Highly effective antiparasitic preparation. This preparation posseses expressed parasiticide action to Nematode and sarcoptic mites. In recomended doses Niacid is slightly toxic to warm-blooded animals, doesn't exert on local-irrilative and senstbilizing actions. Active origin of preparation are antiparasite metabolits of Streptomycetes-producer, obtained by means of microorganism fermentation under conditions depth. Niacid is inserted subcutaneously, dosage being 1,0 ml/50 kg animal mass. 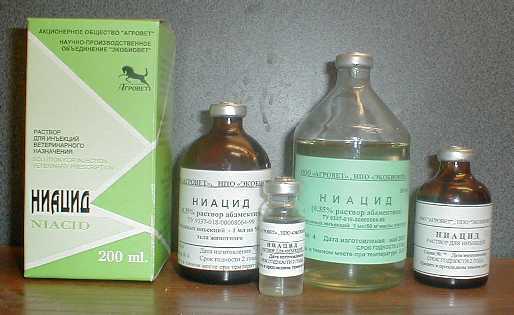 Once-far helminthosis and psoroptosis for prophylaxis; twice, 7 days interval, to cure animals affected by psoroptosis; once to cure animals affected by helminthoses. Niacid less toxic than wellknown analogies (Ivomek). Preparation is not used for dairy cows, weaklings, exhausted animals. Slaughter for meat is not allowed earlier than 30 days after Niacid treatment Whole working with this preparation one has to observe general rules for safety precautions and personal hygiene for seen while working with preparations. This preparation is kept in dry, cool, light protected place. Guarantee data is 24 month since the day of manufacture.